How quickly they grow up! Tonight is the first chance for Dodger fans to see 21-year-old Nathan Eovaldi pitch at home, following his first big league victory this week in Arizona. Fittingly, it comes on the same day that the Dodgers signed their first-round pick, Chris Reed, out of Stanford University. It’s amazing how quickly these things happen. Nathan signed just three short years ago in 2008 and already he’s here and having an impact. Dee Gordon, selected just seven rounds ahead of Eovaldi, is also making his mark in the big leagues already. And then there’s Clayton Kershaw, who is already an All-Star and Cy Young candidate at age 23. We meet many of these kids on their first visits to Dodger Stadium shortly after they sign, and it’s really cool to watch them progress through the minors. I can still remember Chad Billingsley showing up here in 2003, wide-eyed and ready to start a pro career and he’s already been in the big leagues now for six seasons. Of course, some of our youngest players are here now because of injuries or other circumstances, but it’s still incredible to see how quickly they turn into Major League players. That obviously comes with hard work from the player development staff, which is responsible for getting them ready once the scouts go out and identify their talent level as amateurs. It’s a unique process that you don’t really see in football or basketball because there aren’t really minor leagues the way we have it. But for those who see Chris Reed at tonight’s game, be sure to track his progress through the minors. Hopefully he’ll get here as quickly as some of his recent fellow draftees. What an incredible finish today. Facing the prospects of a five-game losing streak and our first four-game sweep at home against the Cardinals in decades, Chad Billingsley came out dealing. But after the Cards took a 1-0 lead on a bloop hit in the top of the ninth, Andre Ethier and Matt Kemp came through in the bottom of the ninth, as they have consistently all season. Andre’s double to lead off the inning extended his hitting streak to 14 games and then Matt Kemp deposited a pitch over the wall in dead center field for his second career walk-off homer. That will hopefully make him feel better about his Lakers losing Game 1! It was hardly the type of four-game series we were all hoping for but hopefully this game will get the team back on track . The Braves come to town tomorrow night, Tuesday night (Fernando Fleece Blanket), Wednesday night and Thursday afternoon (half price food and soft drinks). The offense seems to have clicked last night and raise your hand if you thought Jay Gibbons was going to start out this hot! He’s back in the starting lineup tonight. It’s no secret, the Dodgers need to start winning series against every team to help erase the 4 1/2 game wild card lead and 7 game division lead. It’s not going to be easy, but it’s far from impossible. Last night was a good start to a big road trip. I was surprised to learn today that the Dodgers have won 12 of the last 14 season series with the Phillies going back to 1996. Of course, they’ve gotten the best of us in the two series that matter most, but a game like last night is important because right now, the Phillies are ahead of the Dodgers in the wild card race, too. Stephen Strasburg – is this guy for real? Just noticed that Stephen Strasburg got another win last night and as a few of us were talking in the office today, it seems more and more likely that he’s going to be starting for the Nationals against the Dodgers during our next homestand in our first game against Washington (Aug. 6). As much as it would be nice to miss him, I’m actually looking forward to seeing him pitch just to witness the hype. And if we can beat Ubaldo (the only ones to do it so far), who’s to say we can’t beat this young phenom? To be the best, you’ve got to beat the best! Anyway, I’d imagine tickets will start flying for that game once people realize that he’s scheduled to pitch so don’t say we didn’t warn you! Meanwhile, as impressive as he’s been, he hasn’t had a complete game yet (or a shutout), which is exactly what Chad Billingsley did last night when we needed it most. 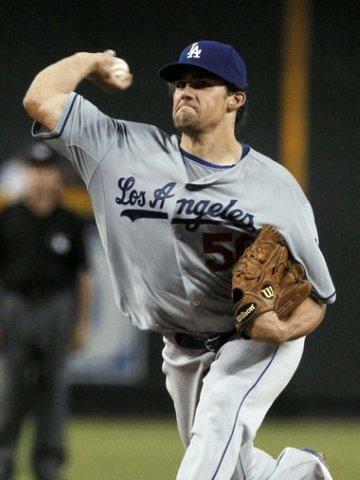 He was very impressive and gave the Dodgers their first complete game of the season. Incredibly, we looked it up and over the last 10 years, 19 different teams have had one or no complete games in a season and six have gone to the playoffs – the Yankees in ’04, ’07 and ’08, the Dodgers in ’06 and ’09 and the Twins in ’06. So, while it would be nice to have a bunch of complete games, not having many clearly doesn’t preclude you from reaching the postseason. I’d imagine each of those teams had pretty impressive bullpens but I wonder if any had two All-Stars on the back end like Kuo and Broxton. Pretty safe bet tonight’s game can’t be as crazy as last night’s. Then again, every time you think that’s the case, something wild happens and you’re left shaking your head. We need to snap out of this funk. A six-game losing streak is never fun, especially coming out of the break. But as we’ve all seen, this team can streak with the best of them and has an ability to come back when everyone least expects it. Here’s hoping Billingsley and the Boys are up to the task tonight. What an awesome series this has been so far! Fifty-six thousand fans, waving towels and getting into the game the last 48 hours. While some say that it feels like postseason baseball in the stadium, I’m not sure it’s quite reached that level. I’d say it’s more like late September pennant-race baseball. But it’s been a heck of an atmosphere in stadium and the finale is just a few hours away. We’ve been so busy with the extra media and all that’s going on, somehow we didn’t post anything Friday or Saturday, but you guys have kept the conversation going on Inside the Dodgers. We’ll figure out a tour soon…and it’ll obviously be open to any and all who read these messages. Should be cool to hear Orel Hershiser break down Clayton Kershaw on tonight’s national telecast. A series win could do a lot to boost the confidence of the team after a tough couple weeks. And with a six-game road trip looming back against the NL West teams the Dodgers seem to play well against (with Billingsley coming off the DL), a win today would be huge. And by the way, if you come out early today, be sure to stop by Viva Los Dodgers and get an autograph from Steve Yeager, who will be signing out there. Joe Torre just passed along the word that Chad Billingsley will go on the DL (though not officially until tomorrow, I think). Vicente Padilla will be back in the rotation this weekend at Fenway Park and as a lifelong baseball fan, I have to say I’m pretty excited to see Fenway Park for the first time. It’s hard to believe that the only parks older than Dodger Stadium are Fenway and Wrigley. Yet our home feels like a baby compared to those. That’s about all for now…need to start a little streak here as we hit the road. Great news…we’ve avoided arbitration with Chad Billingsley and signed him to a one-year deal for next season. I know that there are some fans who seem to be concerned about his second half struggles, but I’m personally pretty bullish that he can bounce back to his first-half, All-Star form. It’s not like the guy was an All-Star three years ago…it was last year, and he was one of only nine starting pitchers named to the All-Star team, so that should mean something. Plus, he had quality starts in seven of his final 13 outings…not stellar by any stretch of the imagination, but it’s not as though the entire second half was awful. Wanted to let everyone know that we’ve received word that Chad Billingsley, who makes his offseason home in Reading, PA, slipped and fell on ice down stairs outside his house and fractured the fibula in his left leg (lower part of the leg). He had surgery today to put a plate into the leg and will be in a cast for two weeks before beginning rehab. The good news, however, is that by all indications and without any setbacks, he should be ready to be throwing bullpens by the start of Spring Training, which is obviously when all the other pitchers are doing the same. I’ll keep you guys posted as I hear more news, but I guess if you’re going to break your leg and you’re a baseball player, November is the right time to do it. We certainly hope he has a speedy recovery and feel free to leave any “get-well” messages here that I can pass along the next time I see him.